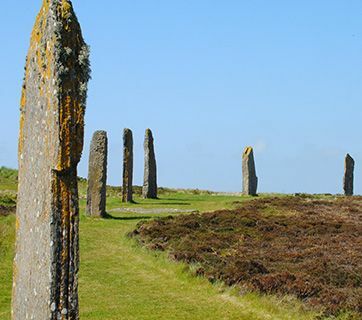 The Orkney archipelago, a patchwork collection of 67 islands across the Pentland Firth from the north-eastern coast of Scotland, has been inhabited for over 8,000 years and contains some of the oldest and best-preserved Neolithic sites in Europe. 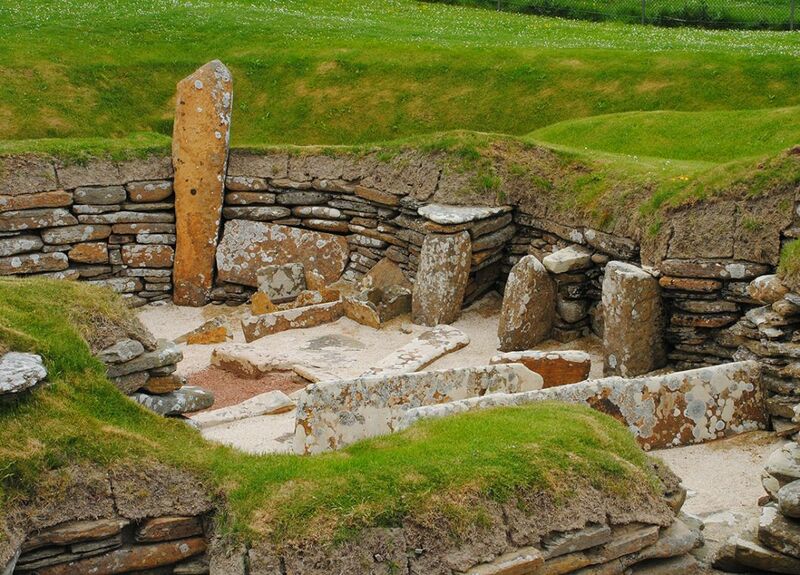 The UNESCO World Heritage Site of the Neolithic Heart of Orkney consists of the Chambered Cairn at Maeshowe, the Standing Stones of Stenness, the stone Ring of Brodgar and Skara Brae, an original Stone Age village, all featured in BBC’s documentary Britain’s Ancient Capital: Secrets of Orkney. 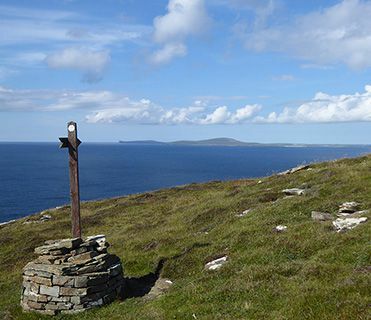 The islanders are also proud of the wealth of Viking history and of their important contribution to the First and Second World Wars through the extensive naval activities in Scapa Flow, including the scuttling of the German Fleet in 1919 and the construction of the Churchill Barriers during the Second World War. 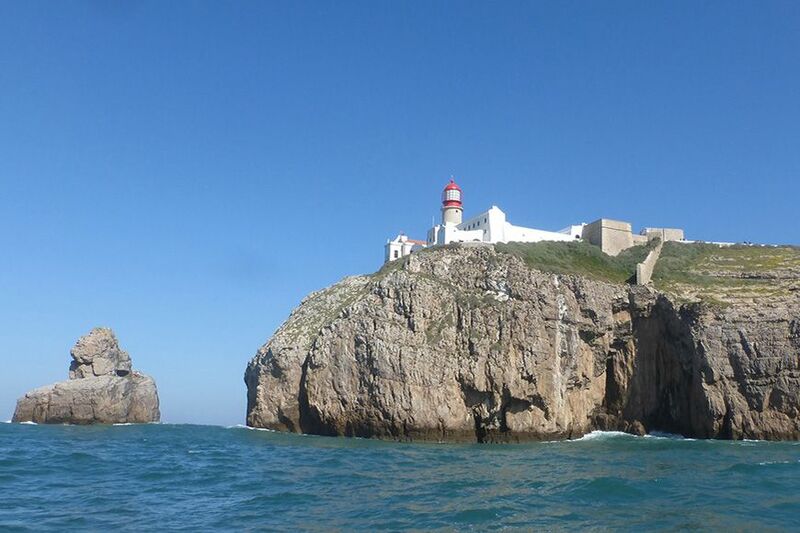 Daily walks in inspiring coastal scenery, accompanied by the cries of myriads of nesting birds, complement the historical content of the tour. 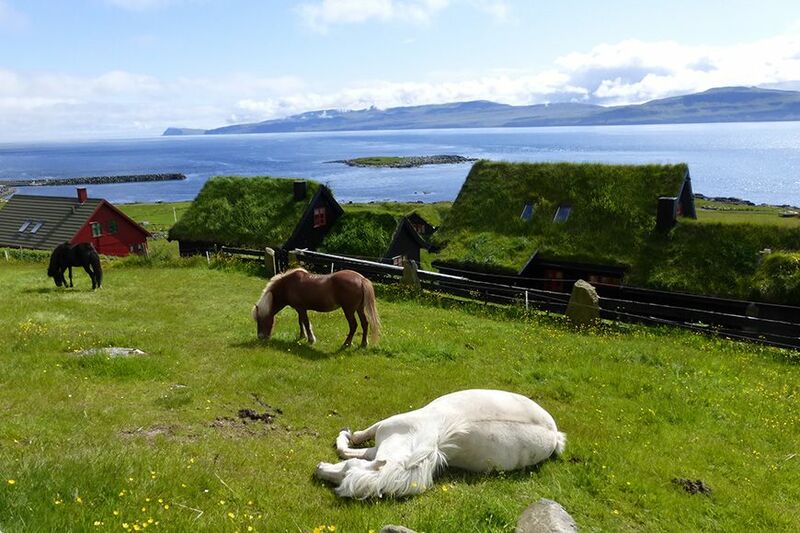 During our week’s stay on the aptly named Mainland community, we visit 7 other islands, some by road, using causeways constructed to impede the progress of the German navy, others by short ferry crossings. 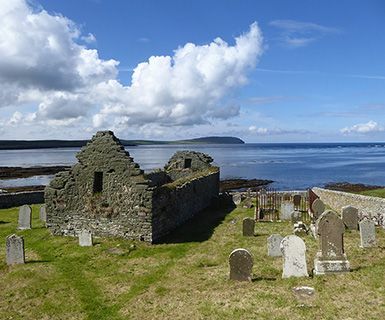 You may be interested in David’s impressions of Orkney during the research trip in July 2017 or this video https://www.youtube.com/watch?v=8zZsw2hZ7ww. Meeting at Kirkwall airport at 18.00, we have a 15-minute transfer to the city and our comfortable central 3 star hotel converted from a 17th century town house. As a welcome drink, we may sample one of nearly 500 whiskies offered by the hotel’s bar, including Orkney single malts. After a rich Scottish breakfast served in the hotel’s garden view restaurant, we head south by road. Our first stop is at the Churchill Barriers and the remarkable Italian Chapel built by Italian prisoners of war working on the barriers’ construction. Near St. Margaret’s Hope, we walk around Hoxa Head Coast Battery, with remains of two WWII gun batteries (5 km/3 miles). In the afternoon, we visit the Tomb of the Eagles, the 5,000 years old chambered cairn at the southern tip of South Ronaldsay, uncovered by a local farmer working on his land. We walk through the current hotspot of British Neolithic archaeology, starting from the Standing Stones of Stenness, past the Ness of Brodgar excavations, to the Ring of Brodgar. Our morning ends with a tour of the Chambered Cairn of Maeshowe. After lunch in Stromness, we take a 15-minute ferry ride to the largely uninhabited island of Graemsay for a 4 km/2.5 mile circular walk. Our 3-star harbourfront hotel in Stromness offers comfortable modern rooms and a popular restaurant, featuring dishes such as scallops in citrus butter or Orkney steak and Orkney ale pie. 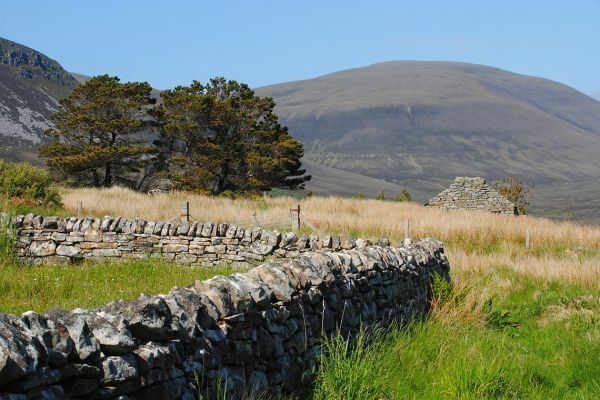 The small island of Rousay is home to 200 people and over 160 archaeological sites. Having crossed from the Mainland by ferry (15 mins), our day visit starts with a short walk on the banks of Eynhallow Sound, packed with important remains including the Neolithic Midhowe Cairn, an Iron Age Midhowe Broch, a mediaeval ceremonial hall and farm and a church abandoned in the 19th century, when it started sliding into the sea. 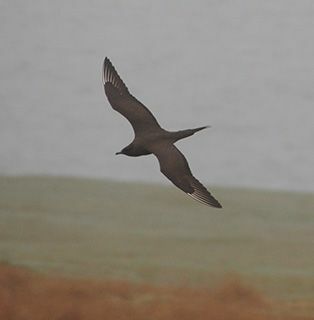 On the opposite side of the island, we walk a 4 km/2.5 mile circular path over a heath-covered headland with views (weather permitting) of Westray island to the north and Egilsay to the east. In Houton, we board the ferry to Lyness on Hoy. 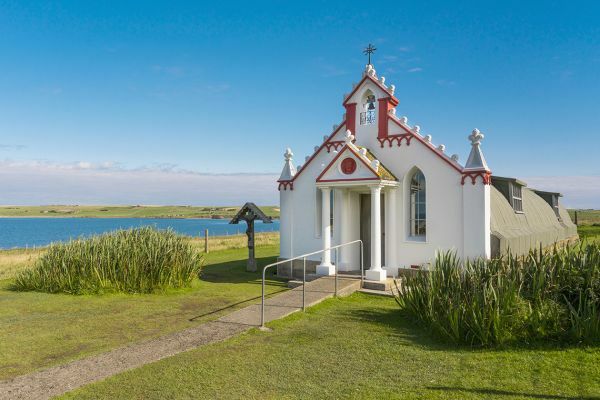 We follow part of the Scapa Flow wartime trail centred around the former fuel pumping station turned into an excellent museum. Later, in the dramatic scenery of Northern Hoy we walk to the Dwarfie Stane, then drive to Rackwick Bay, where we picnic and then enjoy a short walk. 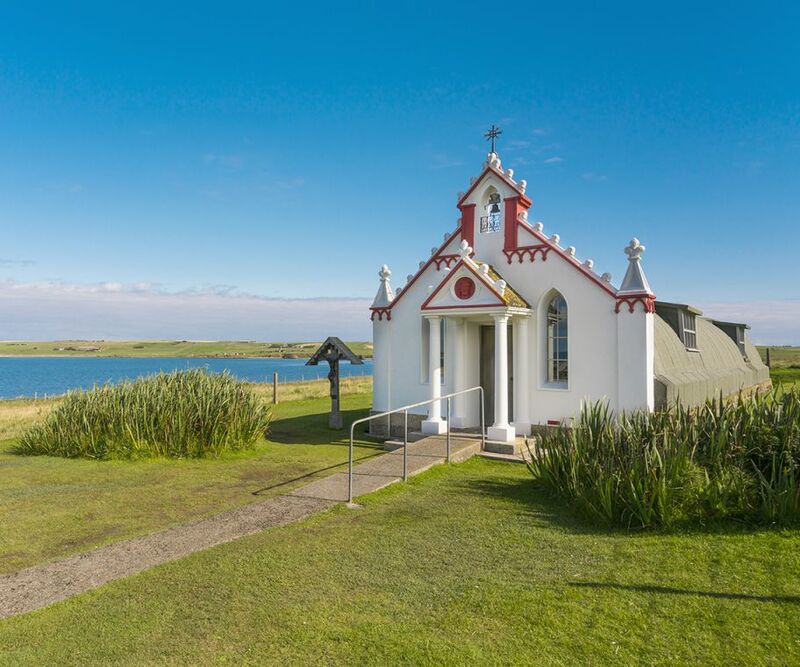 On our return to Mainland, we stop at the Orkneyinga Saga Centre in Orphir, which relates this narrative of Orkney Islands’ history, from their capture by the Norwegian king in the 9th century until about 1200, written by an unknown Icelandic author at the beginning of the 13th century. Our accommodation for the next 3 nights is a charming old-fashioned country-house style hotel near Kirkwall. Our walk (7 km/4.5 miles) takes us to the Deerness Peninsula in the east of Mainland. 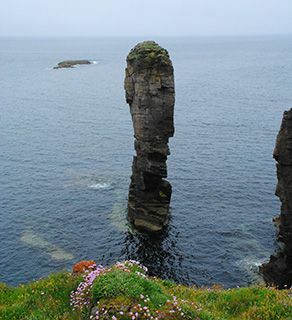 The spectacular cliff scenery includes the Gloup, a collapsed deep sea cave separated from the sea by a broad arch, and the Brough of Deerness, a sea stack with remains of an ancient settlement. 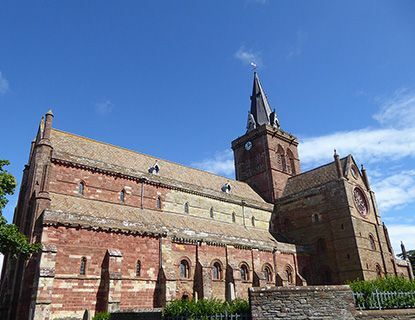 In Kirkwall, we explore the 12th century St. Magnus Cathedral built from the same local sandstone used by the Neolithic inhabitants of the islands, and the nearby contemporary Bishop’s Palace, the town’s oldest surviving domestic building. We dine in a renowned restaurant specialising in dishes made from seasonal Orkney produce, both the freshest seafood from the clean waters surrounding the islands, and beef and lamb from local farms. 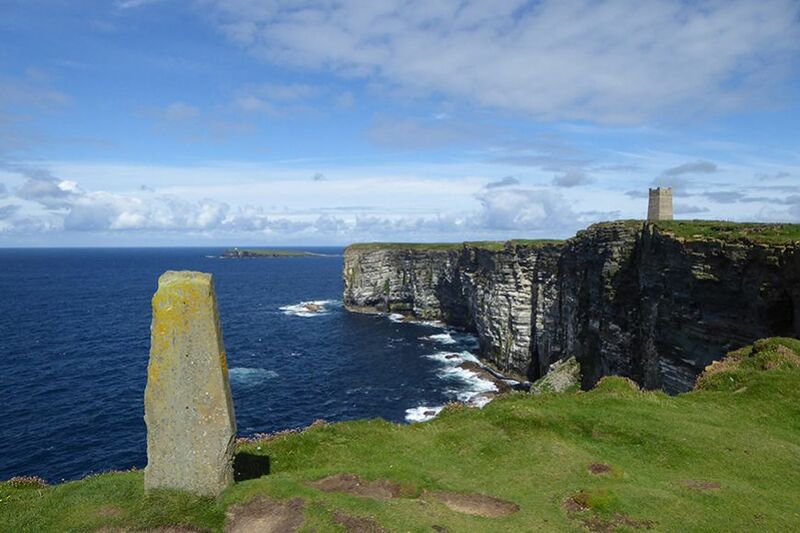 Our day begins with spectacular coastal scenery as we walk to Yesnaby Castle, a stunning 35 m/115 ft sandstone sea stack. Later we walk around Marwick Head, to the clifftop memorial commemorating Earl Kitchener and the HMS Hampshire crew lost in 1916, looking out for seabirds nesting on the cliffs below us. 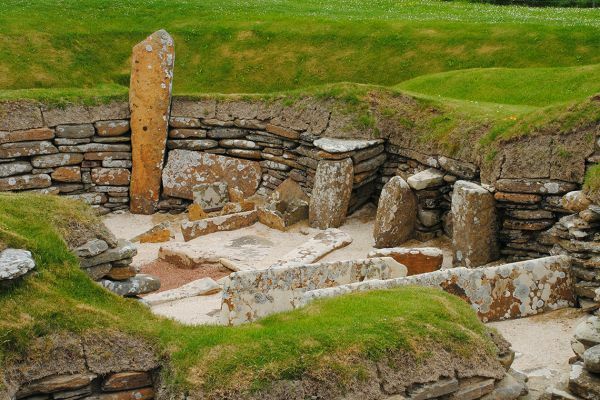 In the afternoon, we visit Skara Brae, the best-preserved Neolithic village in Western Europe, uncovered in 1850, when violent storms erased the sands that had covered this Orcadian Pompeii for thousands of years. Our journey concludes with a morning transfer to the airport. 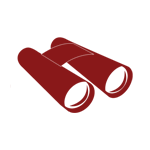 Please note that the single room supplement is imposed by the hotel and not by Kudu Travel. If you are willing to share but no other suitable guest books on the trip, we regret that the supplement will be payable. We shall endeavour to obtain double rooms for single occupancy whenever possible. Ruth Hackney was born in England and now lives in the Mani in Greece. She began hiking at the age of 10 and also enjoyed playing the viola. Armed with an Oriental Studies degree from King’s College, Cambridge and a teaching certificate, she taught English in India, Germany and Greece for 15 years. Since becoming a tour guide in 1996, she has led walking tours in Greece, Scotland and Ethiopia. Visitors from the EU, USA, Canada, Australia and New Zealand currently require a valid passport, but not a visa, for entry to the United Kingdom. If you are a national of any other country, please check visa regulations with your nearest British Embassy. Residents of countries in the EU can only claim free (emergency) medical treatment in the UK by presenting their European Health Insurance Card (EHIC). At present, there are no specific and compulsory health requirements for entry to Britain. You may also wish to check the advice given to travellers by the Department of Health and the FCO. 6 walking days, 2 – 5 hrs daily. Warm waterproof gear is essential. Paths are often wet and muddy. June daily high temperatures range between 14° and 17°C. It is the driest and sunniest time of year in Orkney.